I stated my lack of excitement about the F13 features, but from the presentations, Lucid Lynx does not fare better by any means, here are a few "features" that stuck in my mind: a new (and fugly, IMO) desktop theme, the ability to post to twitter right from the desktop (Gwibber?) 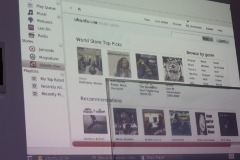 and the ability to buy proprietary music from Ubuntu One. At least the guys were fun and we ended the event with a few beers (and shame to me for attending the event completely unprepared, without a proper T-shirt on me). 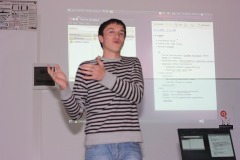 Okay, so you had nothing to do and went to a Ubuntu release party. 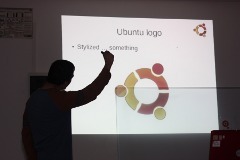 I don't think is worse to get invited and give talks... as long as the talks are not about how Ubuntu is the best thing since sliced bread but you can talk about something you like. Is it wrong that all I really got from your post was this comment? "and shame to me for attending the event completely unprepared, without a proper T-shirt on me" which of course makes me think you had to be in one of these shirts. Benji, I would normally attended proudly wearing one of my Fedora T-shirts, but I was unprepared and went there direcly from work, with a plain kaky one.